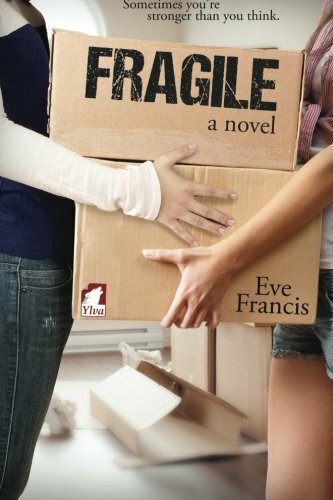 I finished Fragile by Eve Francis yesterday evening. I really had to ponder how I felt about this book, and I think I am going to go with the word “fine”. This book was fine, by no means terrible, but it did not ring any bells for me. Carly Rogers is is two years out of college, and just got a part-time job at Marshall’s department store. She has no goals in life, she cannot figure out what she wants do do with her B.A. in English. So, with no other choices she settles for a job of tagging discount clothes, and ringing up impatient customers. She hates living at home. Her mother is a career driven lawyer, divorced three times, and is cold to her two children. She wants the best for them, as long as that is a thriving career in the corporate world. So, Carly is stuck, the only bright spots for her are an awesome teenage sister, a loyal best friend and the new love interest she just met. Ashley Poindexter is also employed at Marshall’s. For Ashley this is a huge step down in life. She had the give up a career as a contractor, her car, her apartment when her health took a nosedive. Ashley suffers from seizures, and has spent months in and out of hospitals and doctor’s offices. She has lost her independence. This book is well written, the author is obviously a very skilled writer. Unfortunately I just didn’t connect with the story or it’s characters. I just never felt like I really knew what made them tick. The book spends a lot of time with the characters not really doing anything, and the dialogue was somewhat dry in nature. Would I read something else by this author, yes, this just wasn’t the book for me.